Replay the event on-demand beginning October 19, 2018 through February 28, 2019. Event materials on an online host site portal. Invitation to a private Facebook group. Regular updates and advice from our Simulcast Advisory Committee. Listing on our global Live2Lead website. Freedom to set your ticket price, event time, sponsorships and agenda. Please acknowledge that you have received and reviewed the Live2Lead Host Site Terms and Conditions attached hereto as Exhibit “A” and incorporated herein by reference. By voluntarily initialing here, you agree to be bound by the Live2Lead Host Site Terms and Conditions. Please carefully review all portions of this Agreement, and execute this Agreement by signing on the following page. 1. Host Site Designations. 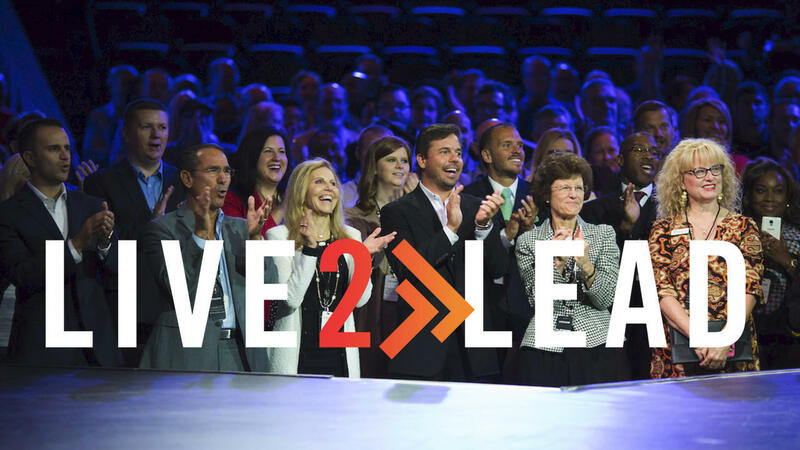 Host may hold unlimited viewings of the Live2Lead simulcast - one Live event or multiple Rebroadcast events. The Public Site Viewing or Private Site Viewing shall have an option to host live on October 12, 2018 or Rebroadcast from October 19, 2018 through February 28, 2019.
a. Public Event – Limited to 10 mile-radius of original public host site venue -- where the Host charges third party individual ticket holders to attend such viewing at the Public Site Location (a “Public Site Viewing”). This agreement allows Co-hosting where hosts come together and host public events where both are working together for a successful event. Hosting separate public events is not permitted; however, each co-host may host private events separately in order to build each individual’s business. 2. Live Broadcast and/or Rebroadcast. Pursuant to this Agreement, Host has received a limited, revocable, conditional, non-exclusive, non-assignable right to receive a web link to the Live Broadcast to use the Live and/or Rebroadcast to offer viewings at the Host Site Locations in the manner described herein. a. Rebroadcast. TJMC will send the Host the web link to the Rebroadcast at least two (2) days prior to the earliest Rebroadcast Date identified herein. 3. Host Site Logistics. Host is solely responsible for marketing, technology support, and resources required to create a successful event. Additional hardware, software and network requirements for the Host’s local equipment may be communicated by TJMC in advance of the Live and/or Rebroadcast Date. Host is required to implement those minimum standards. These include, but are not limited to the Host computer’s processor, RAM, and graphic card requirements, the standard internet browser and version requirements, and the network port unblocking requirements. 4. Intellectual Property; Use of Live and/or Rebroadcast. TJMC will continue to own all copyrights, patents, trademarks, service marks, trade secrets and other proprietary rights (“Intellectual Property”) that TJMC owned immediately prior to this Agreement or that TJMC acquires or creates outside the scope of this Agreement. TJMC will own all right, title and interest to and in all materials, tangible or intangible, developed or created by TJMC during the term of this Agreement, including all Intellectual Property contained therein. TJMC hereby grants to the Host a non-exclusive, non-transferable license to use and enjoy the Live and/or Rebroadcast and any of TJMC’s Intellectual Property provided to the Host in connection with the Event during the term of this Agreement. The Host agrees to safeguard the Intellectual Property and not make the Intellectual Property available to any employee, officer, director or agent of the Host. Host agrees not to record, tape, transcribe, reproduce, resell, repurpose, or store any part of the Event in any form whatsoever without the express written consent of TJMC. Host hereby acknowledges that TJMC is offering the Live and/or Rebroadcast to Host which has no license or ownership right to the Event, and that the Live and/or Rebroadcast Event will only be used as specifically provided in this Agreement and will not be used in any other manner, or for any other commercial or personal use, whatsoever. 5. Event Speakers and Program; TJMC reserves the right to substitute Event speakers for any reason, whatsoever, and to make programming changes as the producer of the Event to ensure the continuity of the Event programming. Any opinions, advice, statements or other information expressed by Event speakers are those of the respective speakers and do not necessarily state or reflect those of TJMC and should not be attributed to TJMC. In addition, TJMC reserves the right, in its sole and absolute discretion, to at any time change, revise, or replace the Event schedule and format, the Event speakers, the Event name, logo and marks, the TJMC marketing materials, and other matters or materials relating to the Event and the marketing of the Event. 6. Marketing and Event Promotion. Host agrees the Event speakers are under contract with TJMC and contacting any speaker or the speaker’s organization/agency to promote Host directly for any reason is strictly prohibited. TJMC will provide Host with the Event speakers’ and TJMC’s style guidelines (“Style Guides”), if applicable and with certain TMJC marketing materials, if any. Host shall use the TJMC marketing materials in connection with Host’s advertisement, promotion, publicity and marketing of the Event and Broadcast Recording viewing. All Event advertising or marketing materials used or created by Host (including those elements containing only the TJMC marketing materials) shall be in compliance with the Style Guides and shall not be used, distributed or publically displayed without first obtaining TJMC’s prior approval of such materials. In addition, Host shall comply with any and all additional marketing requests, requirements and/or procedures provided by TJMC to Host with respect to Event advertising, artwork and promotional materials. Host shall, at the direction of TJMC, immediately remove and cease using and/or displaying any Event marketing materials that fail to comply with the terms of this Agreement. 7. No Exclusivity. TJMC does not offer Host exclusive rights to any geographic area. TJMC shall not be responsible or in any way liable for another host selecting the same geographic area, Host Site Locations, or Rebroadcast Date as Host. 8. Indemnification. Host shall indemnify and hold harmless TJMC, the Event speakers and any of TJMC’s employees, officers, directors, advisors or agents (the “Indemnified Parties”) against any loss (including reasonable attorneys’ fees) incurred by any Indemnified Parties as a result of the Host’s breach of any material provision of this Agreement. The party seeking indemnification under this section 9 shall provide prompt written notice of a claim to the other party. 9. Limitation of Liability and Limited Remedies.
. Limitation of Liability. IN NO EVENT SHALL TJMC BE LIABLE FOR ANY INDIRECT, CONSEQUENTIAL, INCIDENTIAL, SPECIAL OR PUNITIVE DAMAGES, INCLUDING, WITHOUT LIMITATION, LOSS OF USE, INTERRUPTION OF BUSINESS, LOSS OF DATA OR LOSS OF PROFITS, ARISING OUT OF OR IN ANY WAY RELATING TO THIS AGREEMENT. IN NO EVENT SHALL TJMC’S AGGREGATE LIABILITY UNDER THIS AGREEMENT, REGARDLESS OF THE FORM OF ACTION, EXCEED THE TOTAL FEES PAID BY THE HOST HEREUNDER. a. Limitation of Remedies. In the event TJMC breaches TJMC’s obligations under this Agreement, as the Host’s sole and exclusive remedy: (a) the Host may terminate this Agreement in accordance with the terms hereof..
. Total Host Site Fee. Host shall pay TJMC the Total Host Site Fee indicated above. The Total Host Site Fee shall be paid in accordance with the terms indicated above. Any Initial Fee that is due upon execution of this Agreement shall be made by Host by check or credit card and shall be immediately remitted to TJMC upon execution of this Agreement. a. Payment by Credit Card. In the event that Host will pay the fees/deposits/charges due under this Agreement by credit card, as settlement for such amounts, Host authorizes TJMC to charge the credit card indicated for any outstanding balances on Host’s account on the applicable payment due date(s) for such fees/deposits/charges. (For example, the balance of the Total Host Site Fee due will be automatically processed against Host’s credit card on the applicable dates as outlined above.) Host shall immediately notify TJMC of any change to the designated credit card so that any amounts due may be processed. b. Late Fees. In the event that (i) Host does not pay the balance of Host’s account in full by the applicable Total Host Site Fee Due Date or (ii) the charges against Host’s credit card are declined, in addition to any other remedies available to TJMC, issuance of Host’s Broadcast Recording web link will be placed on hold by TJMC, and Host’s account will be assessed, where legal, a late fee/declined credit card fee of ten percent (10%) of the Total Host Site Fee.
. Cancellation by Host. Host may cancel this Agreement by providing written notice of cancellation to TJMC whereupon this Agreement shall be deemed terminated. In the event of such termination, Host shall return the purchase price of the Tickets to anyone to whom Host has sold Tickets, and Host shall indemnify TJMC from any liabilities arising therefrom. a. Default; Termination. In addition to any other right or remedy available to TJMC, Host shall be deemed to be in default, and this Agreement may be terminated for cause by TJMC (“Terminated for Cause”) (or in the alternative, TJMC may suspend performance hereunder and have no obligation and not be liable for any refusal to perform its executory obligations under this Agreement until Host cures such breach) if: (i) Host fails to pay any amount or deposit due under this Agreement within ten (10) days of such amount’s due date; (ii) Host breaches any other material obligation under this Agreement and fails to cure such breach within twenty (20) days after TJMC provides Host written notice of such breach; or (iii) Host acts in any way that is prejudicial to the goodwill and reputation of TJMC. b. Cancellation/Termination Fees. In the event that Host cancels this Agreement pursuant to Section 11(a) above or this Agreement is Terminated for Cause by TJMC pursuant to Section 11(a), and such cancellation/termination occurs: (i) on or prior to the earliest Live and/or Rebroadcast Date, Host will forfeit any Host Site Fee payments paid to TJMC (which shall serve as a termination fee); (ii) on or after the first Rebroadcast Date (but before the applicable Total Host Site Fee Due Date), Host will forfeit any Host Site Fee payments paid to TJMC (which shall serve as a termination fee); or (iii) on or after the applicable Total Host Site Fee Due Date, Host will forfeit any Host Site Fee payments paid to TJMC as part of this Agreement (which shall serve as a termination fee), and Host shall remain responsible for all remaining Host Site Fees due under the terms of this Agreement. The parties agree that in the event that this Agreement is terminated or cancelled as provided in this Section 12, it would be difficult to ascertain the exact amount of damages incurred by TJMC and that the foregoing termination fees are reasonable liquidated damages and not a penalty.
. Notices. All notices, requests, and other communications under this Agreement must be in writing, and must be submitted by mail, express delivery, or email to the Host and to TJMC as indicated below. Notices to Host shall be addressed to the Host Contact at the Host address indicated above. Notices to TJMC shall be addressed to: 2170 Satellite Boulevard, Suite 195, Duluth, Georgia 30097.
a. Nature of Relationship. The relationship of the parties established by this Agreement is that of independent contractors, and nothing contained in this Agreement shall be construed to create a partnership, joint venture or other agency relationship between the parties. b. Governing Law and Venue. This Agreement is governed by the laws of the State of Georgia, excluding any conflicts of laws principles that would provide for the application of the law of a jurisdiction other than Georgia. Any action or proceeding arising from or relating to this Agreement must be brought in the United States District Court for the Northern District of Georgia or in state court in Gwinnett County, Georgia, and each party irrevocably submits to the jurisdiction and venue of any such court in any such action or proceeding. c. Assignment. Without the prior written consent of the other party, neither party shall have the right to assign or transfer such party’s rights or obligations under this Agreement, whether voluntarily or involuntarily, whether by merger, operation of law, a change in control of such party, the sale or transfer of a majority of such party’s voting equity to any third party other than an affiliate, the sale or transfer of a majority of the voting equity of any entity which exercises control over a majority of the voting equity of such party or the sale or transfer of substantially all of such party’s assets. Any transfer or assignment in violation of this section 13(d) shall be void. d. Remedies Not Exclusive. The remedies set forth in this Agreement are not exclusive. Election of one remedy shall not preclude the use of other remedies. e. No Publicity. Neither party shall (i) use the other party’s trademarks, service marks, logo, likeness or name in connection with any advertising materials, or (ii) issue a press release announcing the parties’ business relationship, without the prior written consent of the other party as to the context and content of such materials or press release. Each party shall have the right to terminate any consent provided hereunder at any time by providing written notice to the other party. f. Complete Agreement. This Agreement supersedes all prior discussions and writings and constitutes the entire agreement between the parties with respect to the subject matter hereof. g. Modifications and Amendments. This Agreement shall not be modified or amended except by a written instrument executed by both parties subsequent to the Date of Agreement. h. No Waiver. Except as expressly stated herein, the failure of either party to exercise in any respect any right(s) provided for such party in this Agreement in law or equity shall not be deemed to be a waiver of such right(s). To be effective or enforceable, a waiver by any party of any right under this Agreement must be in a written instrument executed by the party waiving such right(s). i. Invalidity. If a provision of this Agreement is held by a court or other tribunal of competent jurisdiction to be unenforceable, illegal or invalid, such provision shall be limited to the minimum extent necessary so that this Agreement shall otherwise remain in full force and effect. j. Survival. The provisions of sections 5, 7, 8, 9, 10, 11, 12, and 13 of this Agreement, and any other provisions of this Agreement to be performed after such expiration or termination, shall survive the expiration or termination of this Agreement regardless of cause. k. Conflicts. In the event of any inconsistency between this Agreement and any other written agreement between the parties, the terms and conditions of this Agreement shall control and prevail over any such inconsistent provision(s). l. Counterparts. This Agreement may be executed in one or more counterparts, both of which together shall constitute one and the same instrument.